Hunger striking Ukrainian film-maker Oleg Sentsov "wants and hopes to live" but will not stop his protest despite deteriorating health, a rights campaigner who visited him in the Russian Arctic prison where he is held said Wednesday. The 42-year-old Kremlin opponent convicted on terrorism charges has been on hunger strike in the far northern prison for almost three months, demanding the release of all Ukrainian political prisoners. 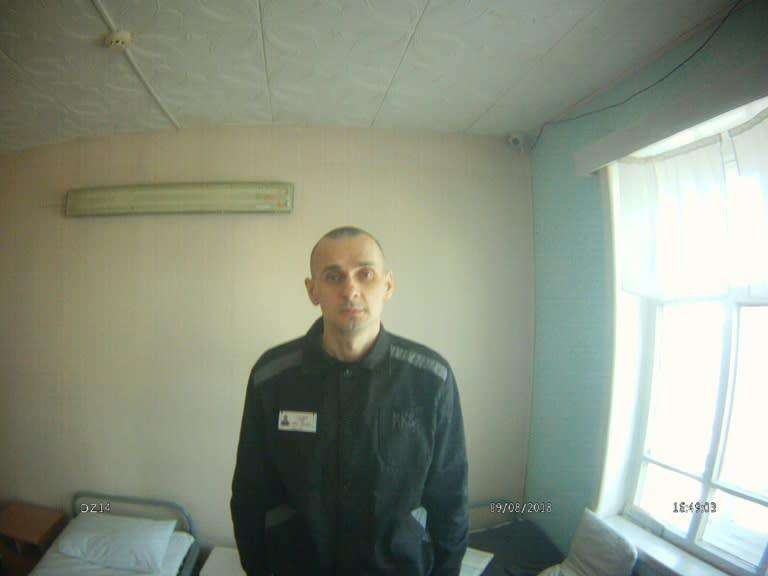 "He is not on a suicide mission, he wants and hopes to live," said activist and journalist Zoya Svetova, who on Tuesday spent two hours with Sentsov in the Arctic prison. "He made me think of a cancer patient who is persuaded he will defeat his tumour and live," she told AFP. "I understood he has no intention of stopping before Ukrainian political prisoners (in Russia) are freed. This gives him the strength to withstand the conditions and the hope that his demands will be met sooner or later," she added. "He has become even stronger. He feels like a man who can help other innocent (prisoners) be freed." He declared a hunger strike on May 14. He has since refused to be transferred to a civilian hospital or to cease the strike. Last week Sentsov's cousin Natalya Kaplan said he wrote to her saying that his "end is near." On Friday, his lawyer Dmitry Dinze said Sentsov was "ready to die." Zoya Svetova said Sentsov told her he was in a "pre-critical" stage and that he is receiving supplements in a drip usually meant for people unable to eat. He told her he lost 13 kilogrammes (28 lbs), while the prison medics said he lost 11. According to Svetova, Sentsov is able to stand and walk and writes and receives "a lot of letters." Western film-makers this week called on Moscow to free Sentsov while French President Emmanuel Macron took up the case in a telephone call with his Russian counterpart Vladimir Putin last week. But the Kremlin has remained unresponsive, repeating on Wednesday that a request for forgiveness can only be filed by the prisoner himself, which Sentsov has so far refused to do.